We provide free use of the hub bike pump. We teach you what is the right tyre pressure for your wheels on the spot and can help you with the use of the pump. Come in and we’ll help you keep your tyres pumped and primed. Maintaining the correct tyre pressure for your bike makes a real difference to enjoying your cycling. We also keep a set of tools for basic bike repairs which are free to use. Flat tyre? No problem! We also offer emergency puncture repair kits. Whether your bike been waiting patiently in the shed for a while, or is looking a little worse for wear after racking up the miles, bring it along to one of our our FREE Dr Bike sessions delivered in partnership with Recyke-a-bike. 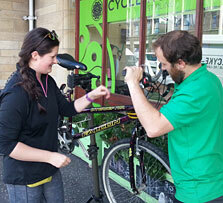 Dr Bike will give your bike a health check. No booking necessary, just bring your bike in to Stirling Active Travel Hub. Check our events diary for the latest dates. Our Mug O' Tea & Spanner sessions, delivered in partnership with Reycke-a-bike, teach you how to look after your bike. You can join all three sessions or just pick one. We offer beginners, intermediate and advanced sessions. Check our events diary and sign up.